Action: Pay 1 to remove Nebulous Ooze from a story to which it is committed and commit a ready [Yog-Sothoth] character you control to that story, without exhausting that character. Flavor Text: The stuff was evolving, shaping itself into a form that would dominate its environment. I've often pondered Nebulous Ooze, straining to visualize how this card would be best utilized. Has anyone seen this card used to good effect? It seems like if this ability was on a big Ancient One, it would be awesome at letting you discourage blockers, but then allowing you to swap the AO out for a chump and now having the AO for defense. But on a card with these meager stats... let's just say no one is scared to block a Nebulous Ooze (if they even bother, that is). 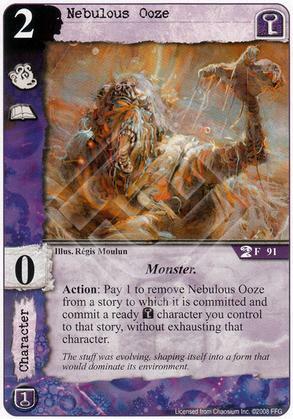 If they don't block Nebulous Ooze, you swap it for a character with non zero skill, maybe an investigation icon, and win 2 or 3 success tokens for 1. It's basically useless on defense, since its ability is to let the the player using choose to swap after an opponent's characters have been assigned, which the defending player already does. But on offense it allows you to make the final commitment decisions with more information, a rare reversal. As a marginal benefit, it also keeps your character standing, so it can be used on defense during your opponent's turn (again, useless if you use the Ooze while defending). That's a big "if," but I see your point. it gives you the flexibility to commit just enough to succeed at the story without having to overcommit. Definitely a narrow effect, but occasionally useful I suppose. I think it's pretty solid, but in a faction with a ton of solid cards. Nebulous Ooze forces an opponent to block with characters that can beat your biggest baddest non-committed dude, which can make combat math pretty difficult, particularly in Yog, which has a bunch of combat tricks already.